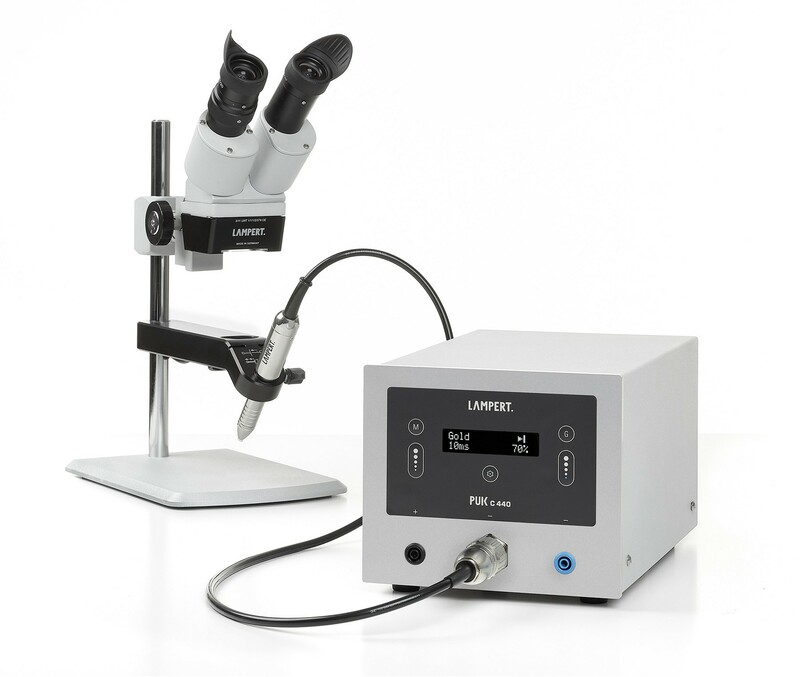 This compact and powerful TIG impulse welder from the experts at LAMPERT is so useful that you'll wonder how you ever got by without it: Use it for spot welds as tiny as 0.2 mm, or for welding deep crevices and other hard-to-reach areas. Because the area affected by heat is so localized, so precise, the PUK C440 can be used adjacent to delicate precious stones and pearls without causing any damage to gems or metal patina. Tack welding mode eliminates the need for wiring before beginning a welding project. Repair, fill pores, or create structures from precious metals, alloys, and non-ferrous metal wire and sheet elements. 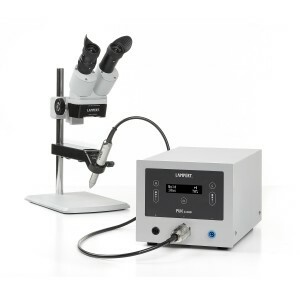 The PUK C440 Complete Welding System includes not only the PUK C440, but also ◆ The LAMPERT SM03 Welding Microscope with an automatically-activating DIN3-DIN11 eye protection filter and 3 watt LED illumination over the working area ◆ Two each of LAMPERT's 0.5 mm, 0.6 mm, and 0.8 mm pre-sharpened electrodes ◆ High-sensitivity LAMPERT Flowmeter argon regulator for superbly accurate readings and better welds ◆ Handpiece with holder, diamond grinding wheel, 0.8 mm collet, contact clamp, cleaning pen, T-connector, and three meter gas hose. All components are made with German quality that you can feel and are protected by LAMPERT's three-year manufacturer's warranty. 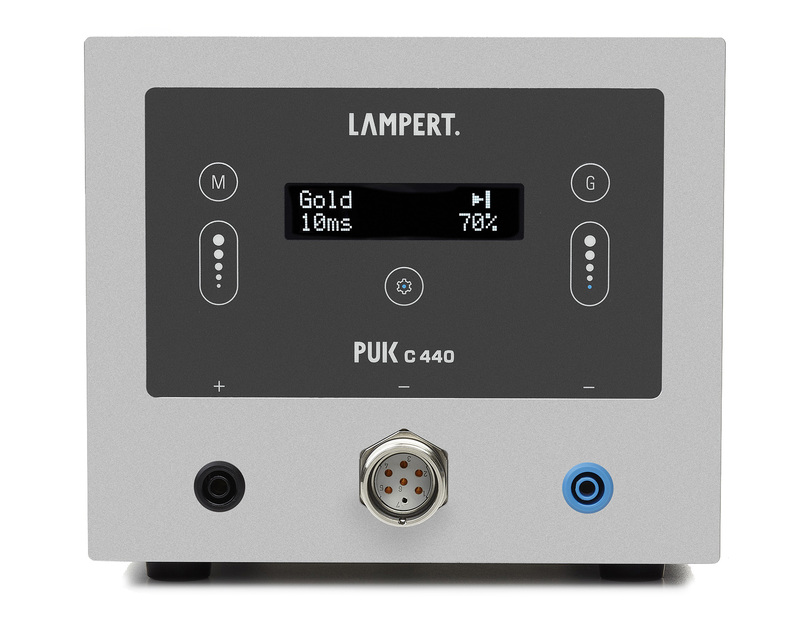 Lampert® PUK C440 Complete Welding System 0.0 out of 1 5 based on 0 ratings. 0 user reviews.